Yeah, our minds are blown too. These kinds of numbers would be a dream come true for any other online shop. Amazon’s sales numbers is a clear indication that the company understands what drives a successful eCommerce business strategy. If you’re looking to take your online store to the next level and drive more revenue to your shop, here are 4 important lessons you should take from Amazon’s playbook. 1) Flash sales drive demand. Frenzies can trigger the primal urge to buy. It’s why Black Friday is so popular and why phrases like “LAST DAY” or “TODAY ONLY” are are so effective on coupons and ads. Consumers don’t want to miss out on a good deal, and the possibility of never being able to buy products (even products they wouldn’t normally be interested in) at a great discount drives them to impulsively buy. 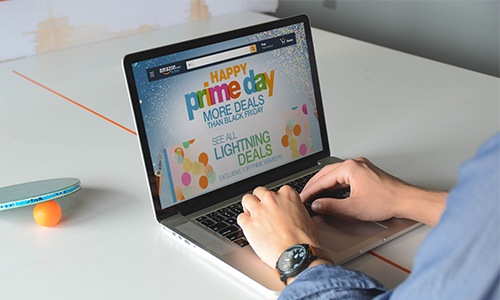 This fear, coupled with Amazon’s animated graphics, countdowns, and carnival-like atmosphere, verifiably turns Prime Day into a fast-paced gamified shopping spree. What can your business do to replicate this frenzied shopping experience? Hold a flash sale.Give selected products a steep discount and pair it with other great benefits, such as free shipping or free return policy. Limit the duration of the sale to a short time period to create a sense of urgency, lest the consumer miss out. Have a countdown. Add a big countdown clock on the front page of your website and the individual product page to remind customers of how soon the deal ends. Make it big, bright, and bold so that it definitely can’t be missed. Make it shareable. After a customer makes a purchase during your flash sale, you’ll want to make it easy for them to share news of the sale to all of their friends. For example, you can give customers a post-purchase coupon to share with their friends, including options to share the product on their social media channels, or give them a graphic or email they can send to everyone they know. Whatever it is you do, encourage your shoppers to spread the word before the flash sale ends. 2) Listen to your customer’s purchasing habits and needs. Amazon’s number one selling item on Prime Day was the Echo. With 33% of shoppers planning to make a purchase via a voice-controlled device in the next year and 19% already having done so, the Prime Day sales indicate that the popular item might also create a shift in consumer purchasing habits. Amazon’s biggest goal for Prime Day is to “experiment and learn more about the customer experience and willingness to shop in new ways.” Last year, Prime Day heavily focused on driving customers to shop on mobile, and this year it encouraged them to order on its voice-controlled device. So before you start advertising your flash sale, analyze your site traffic and see what devices your customers are using to interact with your store. Mobile shopping isn’t a new fad anymore; it is a huge part of how shoppers browse and purchase products, and it isn’t going away anytime soon. Your customers might not be expecting you to be like Amazon and support voice commerce, but your website should definitely be responsive and support shopping from devices of all sizes. It’s vital to analyze your customer data and use it to inform your business strategy. InMoment points out that “listening to the voice of the customer to act on big data insights is the best way to guide the customer experience and direction of the company as a whole.” It takes a well-planned eCommerce strategy to make money online, so don’t be afraid to revise or change your strategies as you track and analyze your performance. What makes Amazon stand out as an eCommerce and marketplace behemoth are its shipping prices, fast website speed, and easy browsing experience. But even Amazon has had a few hiccups along the way. In 2015, Amazon wasn’t prepared for all the demand Prime Day would generate and, as the one-day flash sale became a bigger deal than Black Friday, the company had trouble keeping up with orders. Last year, 2016’s Prime Day check out problems frustrated some shoppers looking to complete the purchasing process. What can we take away from this? Online experience can be just as critical to shopping behaviors as price and convenience. With so many customers abandoning websites for simple things like poor content, unintuitive navigation, slow loading time, or a non-responsive site design, companies should focus on the baseline features that’ll compel customers to complete purchases and keep them coming back. 4) Price can be a strong driver of customer loyalty. Amazon rewards frequent and loyal Amazon shoppers with exclusive deals, discounts, and content to only Prime members. They get early (and sometimes exclusive) access to promotions before the rest of the public. What’s more, Prime Day is an added incentive for shoppers to join their Prime subscription program. That’s what the modern consumer is looking for in a loyalty program: priority, personalized offers and early access to benefits. For Amazon, Prime Day is a way to reassure their members that buying into the $100 subscription is worth it. There are also many Prime members who will never even look at the deals but they will feel good about having access to deals if they actually wanted it. Advertise it. The more “regular” customers who know about it, the more interest it generates. Make the bar for joining low. Make it easy or your customers to become part of the club. For example, instead of requiring customers to have made over $X in purchases before joining, lower the bar to the number of purchases they’ve made, not the amount they’ve spent with your business. This makes your loyalty program more accessible to a greater consumer base, and makes it more likely they’ll spend more money with you in the future. Offer great benefits. From free products to coupons with big discounts, make your customers feel like their patronage is worth it. Help them track their loyalty. Whether it is punch cards or an online tool that tracks loyalty “points”, having some way for customers to track their progress through your program not only incentivizes them to reach the next level of benefits, it also reminds them that you exist and you offer great products. Amazon might be operating at a level that most businesses would have a hard time competing with, but the pillars of their success can be replicated. Prime Day provides industry experts, eCommerce developers, and business owners an interesting look at Amazon’s playbook, what works, and what doesn’t. If you’re interested in strategizing how you can get these tactics to work for you, contact your local eCommerce development experts today (we mean us, of course).